Super Swampers 34x9/16...how low on stock wheels? - THE PORTAL HUB - Pinzgauers, Haflingers, Volvo 303s and more! Super Swampers 34x9/16...how low on stock wheels? Im buildinsg up a trail specific 710M. I mounted a set of 34x9/16 narrow tsl ss super swampers on the stock wheels with out tubes. How do i find out how low I can deflate for the trail w out finding out the hard way? Anyone have experience with this tire offroad? Re: Super Swampers 34x9/16...how low on stock wheels? Pros on the tires: great traction offroad, very impressed. Cons: super sketchy on road. Loud. Took 8 mph off top speed up my short mtn rd (32mph in 4th versus 40mph with smaller tires when i purchased). 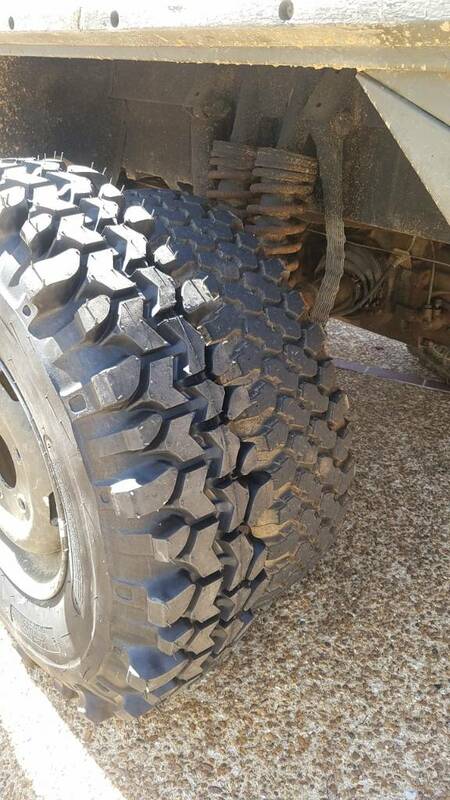 Probably the most out of round tire ive seen, tons of weight to get it even close. 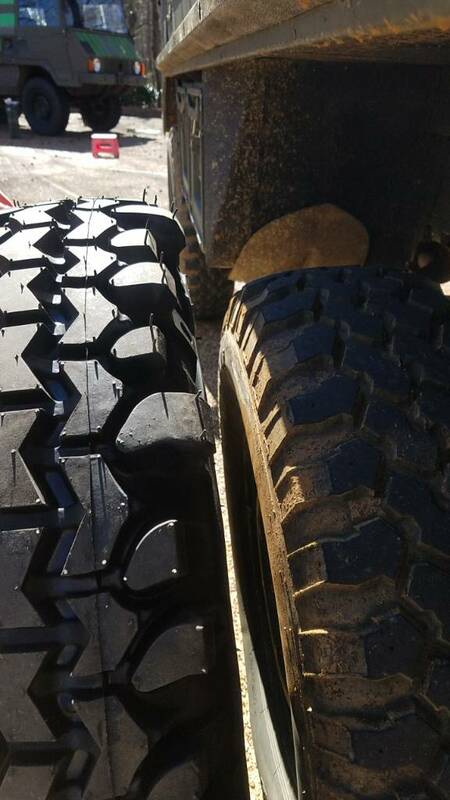 Here they are next to some toyo open country mt's 255/85r16's on 710k. Toyos feel like high performance summer tires compared to the intercos but no comparison on the trail. How do i find out how low I can deflate for the trail w out finding out the hard way? The "rule of thumb" used to be to measure the bottom of rim to ground distance under street pressure, then deflate to 3/4 of that height. Like most rules of thumb, there is both some good and bad to this, and does not necessarily match what you want or need. But with that much sidewall, 3/4 the height should be fairly low pressure. Hopefully someone will chime in that has experience with these tires and/or size. Those are mean looking! They are amazing off-road, esp. in mud, and not so much on-road. Given the width and how stiff those sidewalls are, I'd guess around 14-15psi. No experience with those tires but your rule of thumb will likely not work as the stock Pinz rims have no inner safety bead like most other rims. The tire can lose its bead (to the inside) pretty easily if you go too low psi. I agree - it would be best to swap out the original wheels with a pair of Ford Transit wheels as they not only have the bead retention "humps" but they also will add about 3/4" of width on each side to enhance stability. When the height of the tire is increased it is actually beneficial to use a wheel with less backspacing or add a spacer so that the "contact patch" of the tire remains in the correct location. If you could draw a line through the steering pivot kingpins to the point where it hits the ground - that should be in the center of the tires contact with the ground for best steering feel and lowest steering effort. Since this imaginary line is at an angle due to the location of the kingpens, when a taller tire is used the line's point at which it contacts the ground moves outward - which is why the wheel also should be moved outward too. Are you getting any rubbing with the 34" tire? You might consider adding a tube spacer on the top of the front springs to lift it about 1.5 inches - worked great on several trucks that we have tried it out on. Last edited by Haf-e on Tue Mar 13, 2018 12:11 pm, edited 2 times in total. I have only had them out twice and nothing extreme enough to experience rub if its going to happen. I was concerned after mounting....it will be close for sure. I might as well get the transit wheels....im going to end up with the disc conversion anyway im sure Your comments on contact patch are spot on...i can see it on the truck. I thought about the 9.5's but went this way. Probably try them out next time. I think for the stock and Transit wheels (both are 6.5" wide) the narrow TSL 34x9/16 is a good choice since it is spec'd for a 7" wide wheel. The new SX2-50 is spec'd for an 8" wheel and I wonder if the tread would end up being too rounded when mounted on a 6.5" wide wheel. The SX2 is being made using a much more advanced molding process which hopefully will result in it being less out of balance and more true in shape than the traditional swamper tires. There will be a Pinz 710M running with set of the SX2-50 tires very soon on some new 8 inch wide steel wheels specifically made to work with the disc brake conversion - we'll post the pictures as soon as they are mounted up.